I love this little Memory Box Dress Die from FATCATS Card Corner. All other dies used are also available from FATCATS Store. Cards for men are not always the easiest to make. 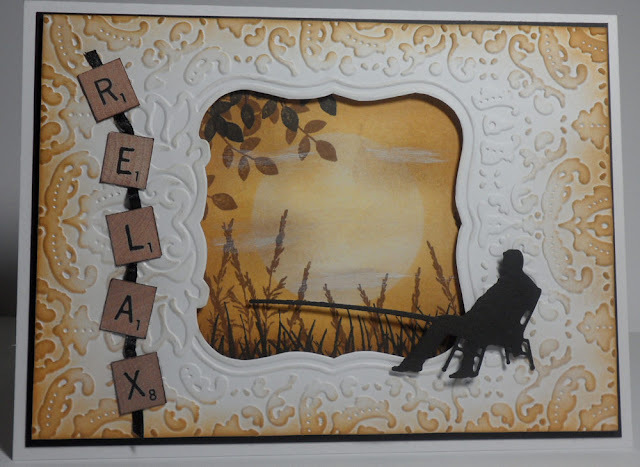 I also used the Spellbinders M-Bossabilities Framed Labels embossing folder. 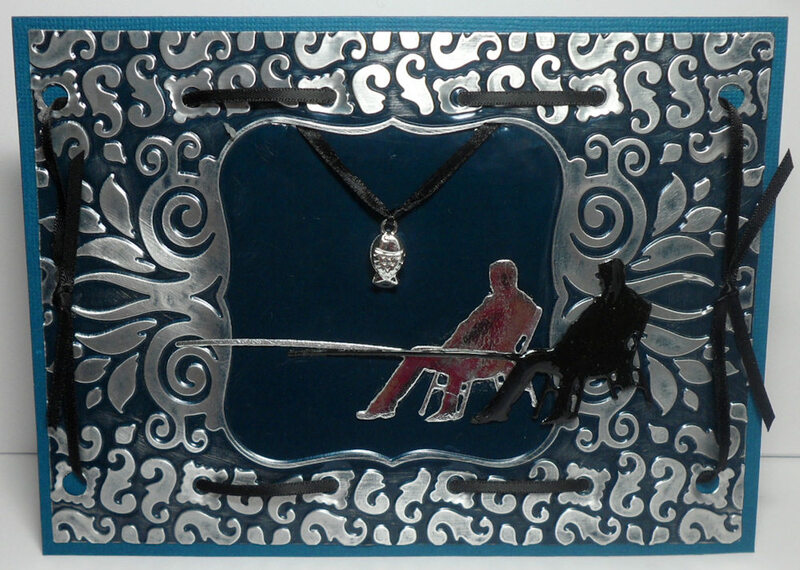 On the one below I used a navy craft foil which I sanded. 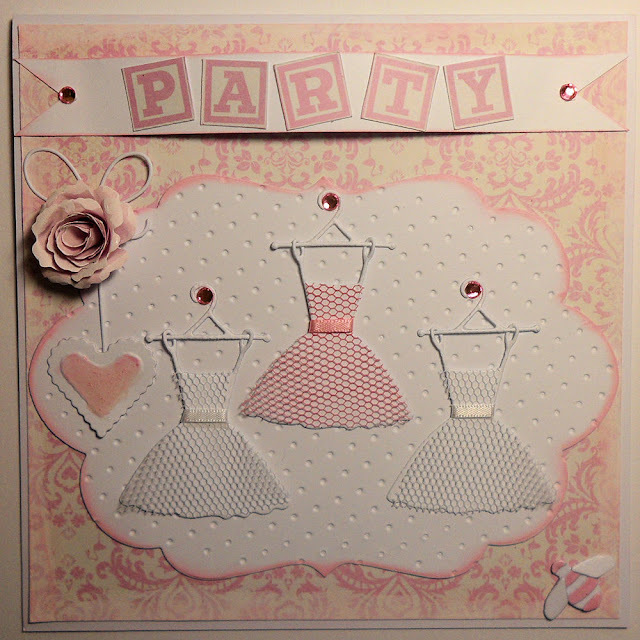 I've been playing around with stamp pads and stamps to make my own backgrounds for my cards. For this one I used the Festive Berries Distress Ink Pad dabbed it onto my craft sheet and instead of spraying it with water I used Glimmer mist. 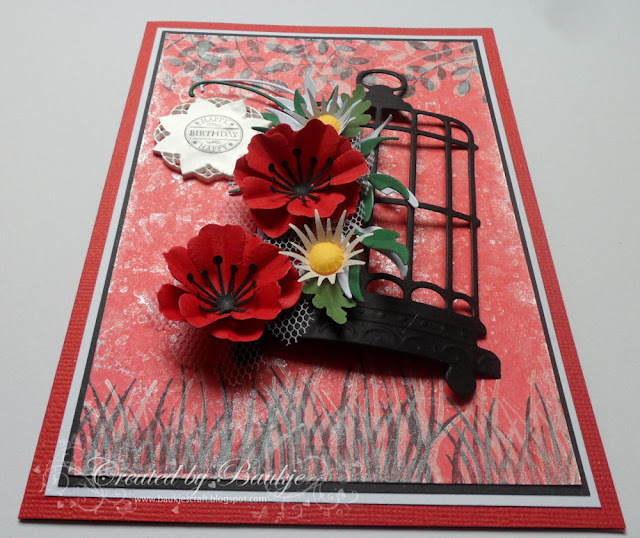 The Marianne Creatables Bird Cage Die and Memory Box Cherry Blossoms die (used to make the red flowers) are available from FATCATS Card Corner as is the leafy flourish the sentiment die and the ink pad. 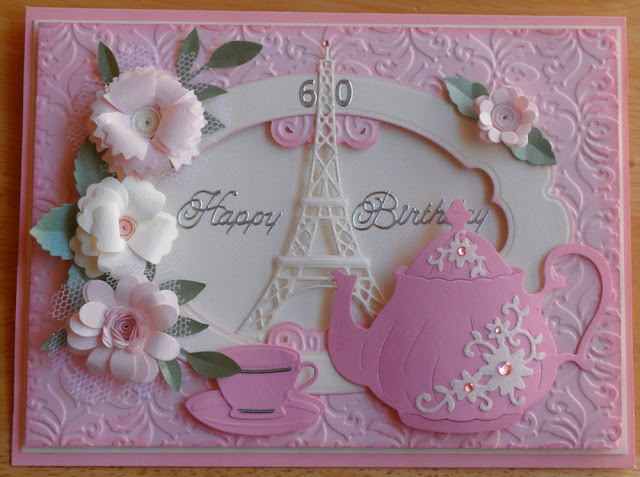 This is the other card I have managed to make so far this year it has been received now so I can show you. My dear friend Angie is turning 60 and has invited her family and friends to join her in a "cuppa" on the afternoon of her birthday. 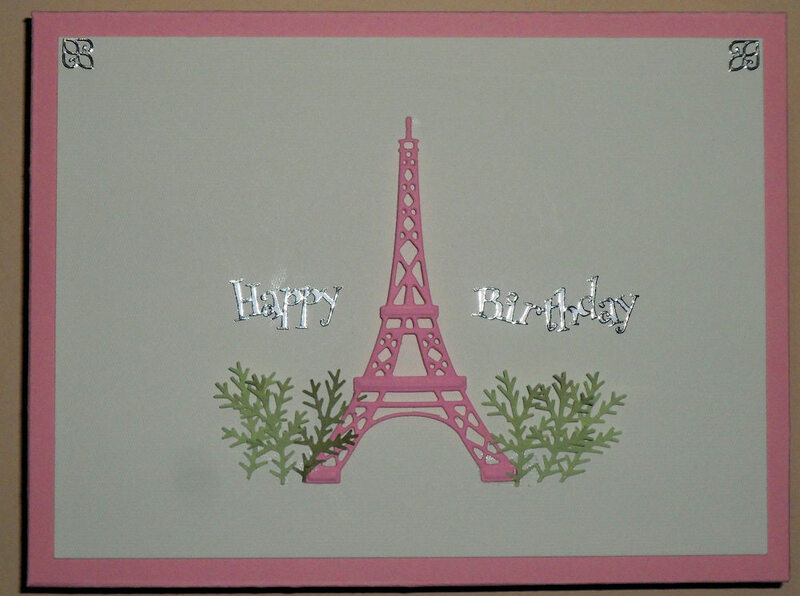 All of the bits and pieces except for the Eiffel Tower, I have used on Angie's card are bits and pieces she has cut and sent to me over time. Below is the box I made to send it in. I hope you all had a wonderful Christmas and have a Happy, Healthy New Year ahead. I have finally been able to make a couple of cards, since getting home I just hadn't felt like doing much crafting. I want to start using my stamp pads and stamps more for making my own backgrounds so for this card I took a piece of white card stock, and using The Distress Ink pad festive berries I swiped it a few times on my craft mat and instead of spritzing it with water I used Glimmer Mist then wiped my white card stock over it until it was completely covered. After waiting for it to dry I stamped the leaves and grass first with some white ink, then went over it again with the black ink. 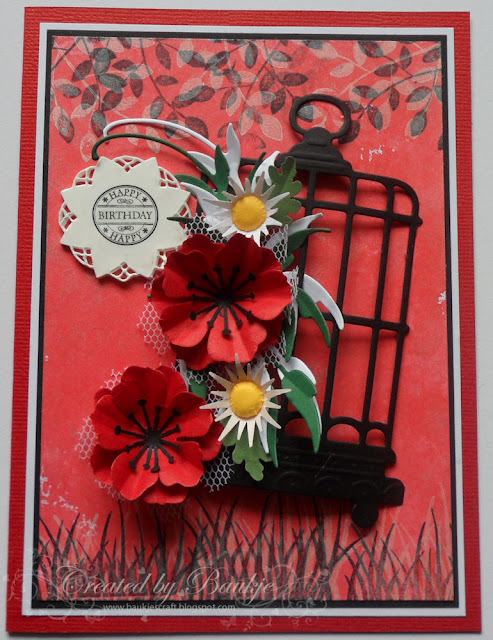 The bird cage is a Marianne Design die as is the leafy stem. The sentiment has been stamped onto the Marianne Design Floral Circle Die using shrink plastic. The red flowers I made with the Memory Box Cherry Blossom die and the little white ones I made with some punched out pieces that were sent to me. Below I have tried to show the sheen on the background using the Glimmer Mist.